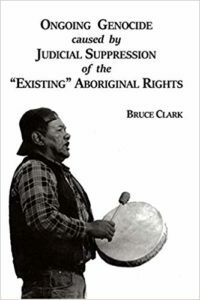 The book concludes by pointing out an error in the Supreme Court Case Tsilhqot’in v. British Columbia, 2014 that is at odds with precedents such as the Royal Proclamation of 1763 and section 109 of the Constitution Act, 1867. In recent years the BC provincial government and federal government have apologized for the wrongful hanging of six Tsilhqot’in chiefs.4 Despite this, the BC government and Taseko Mines have continued to undermine Indigenous sovereignty, with repeated attempts to set up and operate a gold and copper mine in the Tsilhqot’in nation. Correction: The proposed Taseko mine has been changed to “gold and copper.” — 15 November 2018. This article was posted on Tuesday, November 13th, 2018 at 2:26pm and is filed under Book Review, Canada, Courts and Judges, Genocide, Justice, Legal/Constitutional, Original Peoples, Police, Settler Colonization, Supreme Court, Turtle Island.